The famous Hachiko Monument with New Years decorations. The famous Hachiko Monument with New Years decorations. Update to the JapanesePhotos Instagram at: http://bit.ly/2j3LNB2. OMG! Amazon Japan and Kuroneko work on New Year’s Day! OMG! Amazon Japan and delivery companies still work on New Year’s Day! It’s an important family day, but they still soldier on! Update to the JapanesePhotos Instagram at: http://bit.ly/2hY4aWN. Welcome to 2015! I hope all goes well for you, and that you have a great new year. What better way to start the New Year than with a coupon for 10% off any photo purchase, but only for images on my PhotoShelter portfolio. No restrictions on the number of times you can use it, and you can pass the coupon on to anyone. Minimum purchase is USD$20, until 31st January (New York time zone). This can be used for personal and professional uses including personal and professional blogs, licensing, gallery quality prints, t-shirts, mugs, and lots more. Welcome to the New Year. Hope all your dreams, plans, and endeavours come true, better than you expect. The photo below is a typical Japanese concept; showing the first sunrise of the New Year is an iconic image. Here, it shows popular amusement park, Nagashima Spa Land. Also, here’s a video and wonderful music of a New Year sunrise. New Year’s Eve is a special time in Japan. Since the 1980’s and Wham’s song “Last Christmas”, Christmas in Japan has become known as a time for romance and young couples (Japan Today). However, New Year in Japan is a family time. It’s also a time when mainly men, after the family has gone to bed, go to the local temples and shrines to hear the sutra’s and prayers read to ring in the New Year, and to hang out and drink sake with their local buddies in the freezing cold. Enjoy your New Year’s Eve and night. 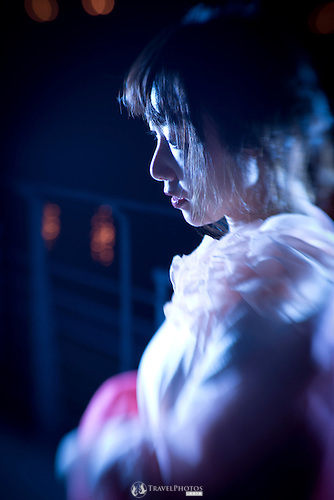 This Photo of the Week (POTW) is from a shoot I did in the early autumn in Osaka. As you can see, it’s a great way to send a message. For this photo, and others like it, see Ana’s Gallery on my PhotoShelter portfolio. Also, there’s a discount coupon available, with a very, very limited time it’s still available for. Finally, have a happy and prosperous 2014. A young lady holding a message. Wishing you the best for the New Year for you, your friends and family, and all your endeavours. Go to your parents’ or grandparents’ house. Travel on overcrowded bullet trains (aka ‘shinkansen’), or wait in long airport cues to check in and fly, whilst hoping the poor weather isn’t going to delay your flight. Or travel on overcrowded and expensive expressways along the width of the country. Go to a temple or shrine just before the turn of midnight to pray and to hear Buddhist sutras read to welcome in the new year. Then ring the temple bell. Go to a local Shinto shrine and have noodles and sake, and gather round a fire to keep warm. See the first sunrise of the year. Watch the Vienna New Year’s Eve concert. Return from your parents’ or grandparents’ house. Travel on overcrowded bullet trains (aka ‘shinkansen’), or wait in long airport cues to check in and fly, whilst hoping the poor weather isn’t going to delay your flight. Or travel on overcrowded and expensive expressways along the width of the country. This image below, and others like it can be found on my PhotoShelter portfolio and still more like bullet train pictures at my agent’s website at Asia Photo Connection by Henry Westheim.